From the award-winning author of American Canopy, a dazzling account of the world's longest road, the Pan-American Highway, and the epic quest to link North and South America, a dramatic story of commerce, technology, politics, and the divergent fates of the Americas in the nineteenth and twentieth centuries.The Pan-American Highway, monument to a century's worth of diplomacy and investment, education and engineering, scandal and sweat, is the longest road in the world, passable everywhere save the mythic Darien Gap that straddles Panama and Colombia. The highway's history, however, has long remained a mystery, a story scattered among government archives, private papers, and fading memories. In contrast to the Panama Canal and its vast literature, the Pan-American Highway--the United States' other great twentieth-century hemispheric infrastructure project--has become an orphan of the past, effectively erased from the story of the "American Century." The Longest Line on the Map uncovers this incredible tale for the first time and weaves it into a tapestry that fascinates, informs, and delights. 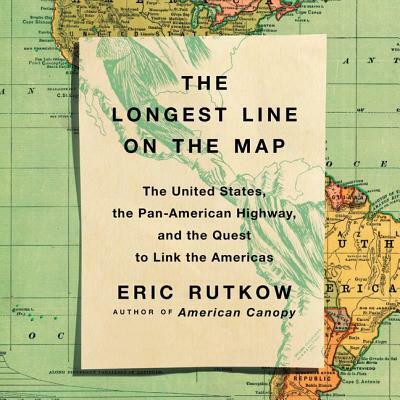 Rutkow's narrative forces the reader to take seriously the question: Why couldn't the Americas have become a single region that "is" and not two near irreconcilable halves that "are"? Whether you're fascinated by the history of the Americas, or you've dreamed of driving around the globe, or you simply love world records and the stories behind them, The Longest Line on the Map is a riveting narrative, a lost epic of hemispheric scale.